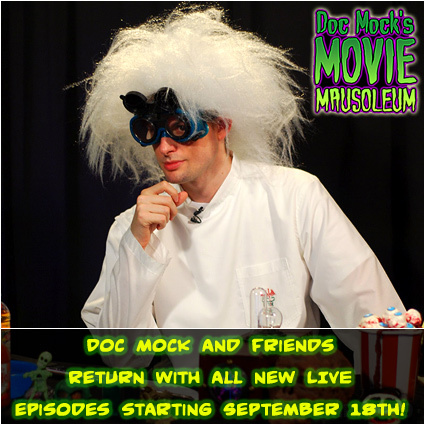 Doc Mock’s Movie Mausoleum » Blog Archive » Doc Mock & Company Return Friday, September 18th With All New LIVE Episodes! Doc Mock & Company Return Friday, September 18th With All New LIVE Episodes! Hope to see all of you guys in the chat rooms on Friday, September 18th when we return to the air! Until then, be sure to get caught up with our most recent episode if you haven’t seen it already! And if you have… watch it again! Watch all of them again! It’s good for your cholesterol level! Trust me… I’m a doctor! Always follow doctor’s orders. Can’t wait to see you guys again, it’s been far too long! whose movies would delight and shock! and since then I’ve stared at my clock.